I listened to my friend talk about his impending fatherhood. I admired the sonogram of his child and listened to the excitement in his voice looking forward to hearing his little one’s heartbeat for the first time. I recalled going through that same experience with my own child. The first time seeing his image. The first time feeling a flutter of movement. The happiness and relief of hearing his healthy heartbeat at each doctor visit. Just last week I put my lips against my son’s sleeping neck and marveled at how the beat I was feeling is the same one I listened to six years ago in the doctor’s office. What a miraculous display of life. Then I hopped in the car, turned on the radio and heard that little children and teachers had been slaughtered in a school in Connecticut. When I was pregnant with my son I couldn’t wait for him to be born. I felt that if I could just look at him and hold him in my arms I could finally relax with the confidence that he was ok. Our first night at home after his birth I discovered how faulty my logic was. All the concern and worry for his well-being while in utero was just the beginning of a lifetime of being consumed with protecting him and keeping him safe. I stood over his crib convinced that I would never sleep again because I would have to sit up 24 hours a day watching over him. Elizabeth Stone said, “Making the decision to have a child is momentous. It is to decide forever to have your heart go walking around outside your body.” No truer words were ever written. I know every parent can relate to this and I feel a certain joy and common bond in knowing that other people experience the same intense love for their children. The biggest comfort comes from knowing that when my child is afraid of the dark, or the witches that lurk in the crack between his bed and the wall I can assure him he’s ok. I can help him be brave. I can sing to him or honor his request to “lay back to back” to let him know he is safe. The reality that situations exist in which I could not protect him is unfathomable to me. It’s almost a place I cannot allow my brain to go. As a human being and a parent of a similarly aged child, the murders at the Sandy Hook School in Connecticut have been heartbreaking and hurt my soul. I don’t understand how the world keeps spinning when something so evil can exist. My heart is incredibly heavy for the families. I’m sure like many people, I wish there was something useful I could do. In the meantime, I personally find it important to read the names of those who were killed, read their stories, listen to their families’ statements. I want to bear witness to the fact that they were here. That they were loved. That their mothers and fathers listened to their precious heartbeats. This entry was posted on December 16, 2012 by elisabethakinwale. It was filed under Uncategorized . So, so true, Elisabeth. I’m watching Obama speak as I write, and he is saying the exact same thing. 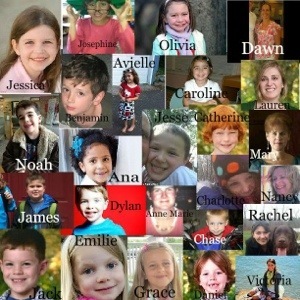 Bless those little children and those heroic teachers, and bless their families who will somehow have to move forward. Beautifully written Elizabeth. I remember that same sense of being overwhelmed the first night we took our daughter home from the hospital and trying to figure out how we would care for and protect her. My heart broke when I heard this on Friday night and hugged my daughter especially tight when I got home. Thanks Mike. I agree about the tighter hugs and such. I think it all puts a different perspective on things and reminds us to appreciate our blessings. Thanks for your words. Although my children are grown and gone from my home , tonight I traveled to see one of them at a church dinner. Two of my grandchildren were close to the ages of these children that were needlessly murdered. As I held my granddaughter on my lap, dressed in her beautiful Christmas dress. My heart grew heavy thinking of the many parents and grandparents that will be unable to hold their precious children this Christmas holiday or any days ever again. I hugged her close to me and kissed her cheek. Thankful to have her safe but broken hearted for all those,in pain for such a senseless act of violence. Thank you Elizabeth for writing what is on your heart and giving me the opportunity to do the same. May your child and all our children be safe from anything like this in their lifetime. Finis, thanks so much for sharing your thoughts and voicing those conflicted feelings of enjoying your beautiful grandchild but still hurting for others. I’m sure those feelings are shared by many of us. I appreciate you posting. A way with words. Beautifully said. I couldn’t help but feel a bit angry at the fact, yes we as parents protect our children for countless hours. We put faith in our societies system to do the same, as we have responsibilities to honour our children with. How can these systems fail us and our countless hours of protecting our children the same way we protect them. It seems like a contradiction to the essence of life, society, and community. Thank you Elizabeth for writing this. I agree Nikol. We have to be able rely on one other not only to not to do harm, but couldn’t we actually help one another? Is being kind and decent such a stretch? For the overwhelming majority I think it’s not. Maybe not enough of us, I don’t know. EA – You write so beautifully. Made me cry. You said it perfectly. Nice to hear from you Fran, I’m wishing the same. Thanks Brian. I do think something horrific like this makes the rest of us appreciate our blessings. That tantrum or running late or whatever seems pretty darn insignificant, appropriately so. “Here’s to making it count” my favorite quote from the movie Titanic. Elisabeth. Just wanted to wish you a Merry Christmas. Keep being an inspiration to me and my group of knuckle heads who are being committed to fitness. Thanks for being you. Hey Elizabeth I’m new to the whole crossfit nation but been lifting and personal training for years and must say im a huge fan of your. You fit, tone, and beautiful. If you ever in the St. Louis area please stop by my gym which is Club fitness in St. Charles.